DMR Bikes had plenty to be excited about at Eurobike 2017, including new pedals and new grips that we’ll get to shortly. 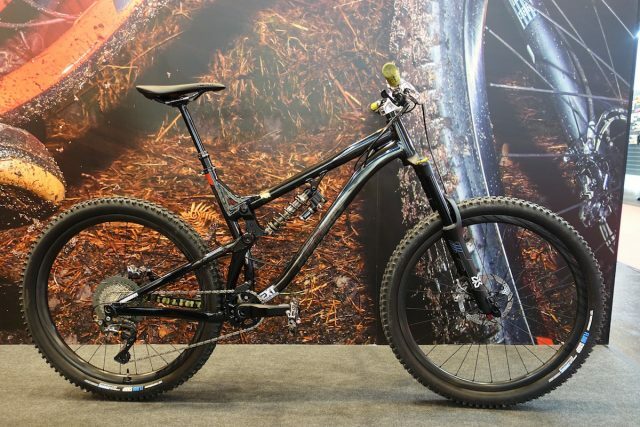 However, most of the excitement was due to this being the first time the British brand would have a long travel full suspension bike on display for the European audience. 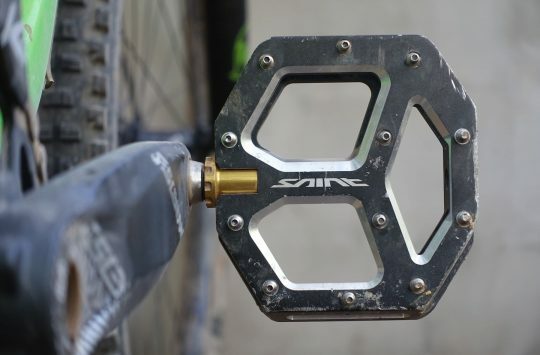 The 160mm travel SLED was first released at the start of this year at Core Bike, and we have since received one in the office for testing. You can read our full review of the DMR SLED online right here. 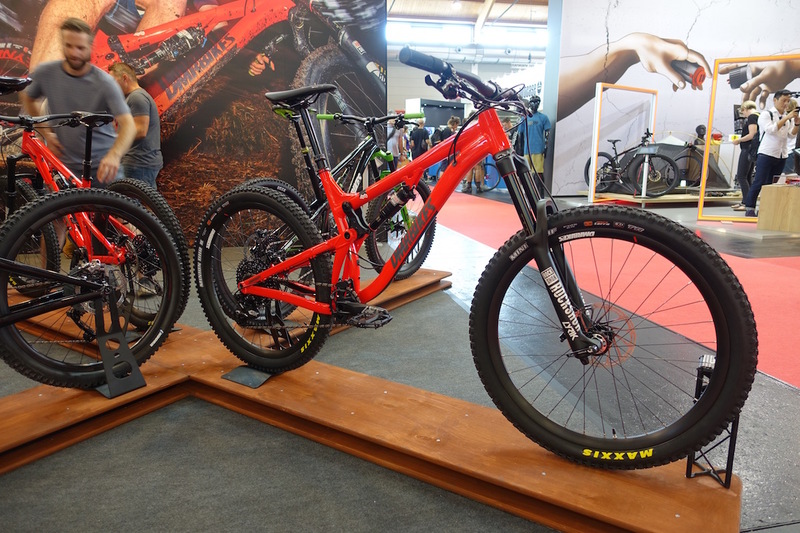 However, DMR didn’t just turn up to Eurobike with the same ol’ bike (you know, because a 9 month old bike is considered ancient these days…). 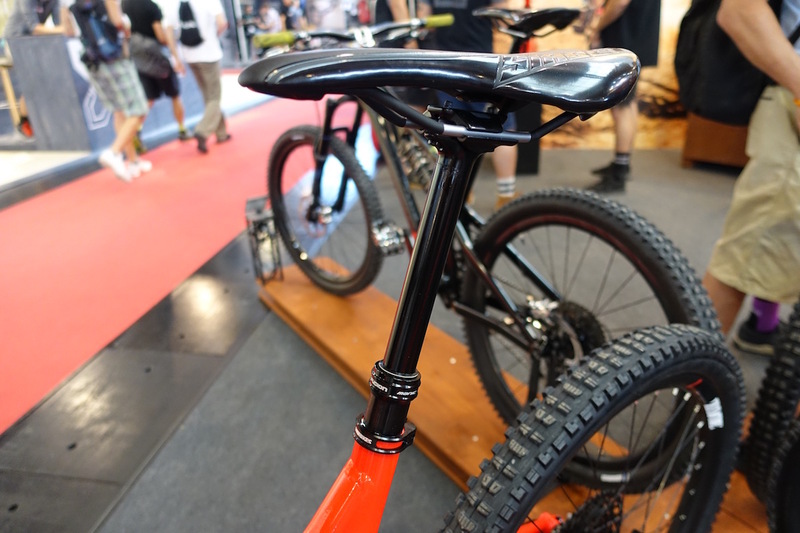 Although the Infrared SLED shown here looks the same as the bike we tested, there are a few changes to the spec, along with a hidden tweak that’s had a serious change to the bike’s geometry. The 2018 DMR SLED, with several key spec changes to address some of the issues we had with the original model. The SLED is available both as a frameset and as a complete bike. There is only one spec option for the complete bike, which is the red bike shown here that features a SRAM 1x drivetrain, DMR Zone wheels and a RockShox suspension package. While the frame remains the same, for the 2018 model year, there have been a number of changes to the specifications that aim to address some of the issues we identified during testing. 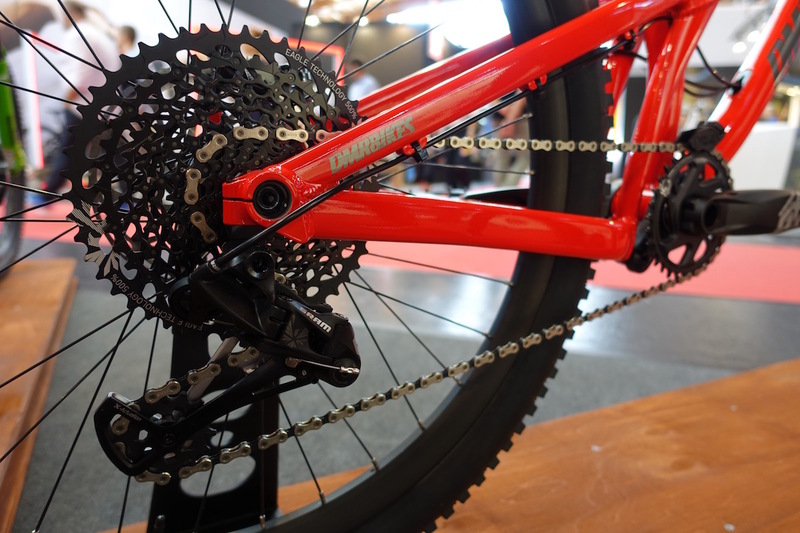 For a start, the SLED updates to a SRAM GX Eagle 1×12 drivetrain, due to the new 12-speed drivetrain having only became available after the SLED was first launched. 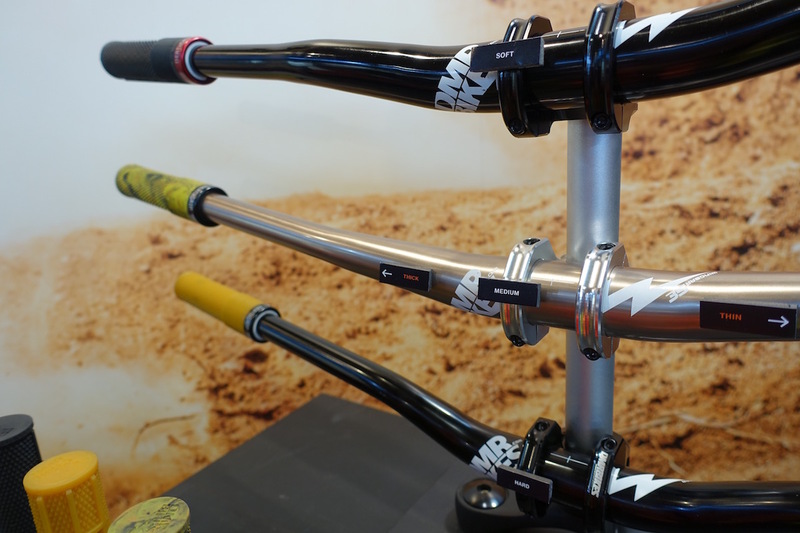 The fork also updates to a 2018 model, and you can choose between a 160mm travel Pike, or a 170mm travel Lyrik. 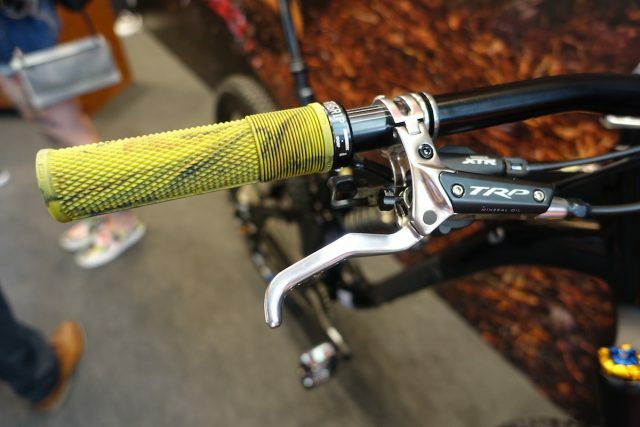 DMR has also upped the dropper post travel to 150mm for the X-Fusion Manic, and swapped the slippy non-locking grips to a new Deathgrip lock-on grip (shown below). The tyres have also been changed from WTB to Maxxis, with the excellent Minion DHF/DHR combo wrapping the DMR Zone wheels. 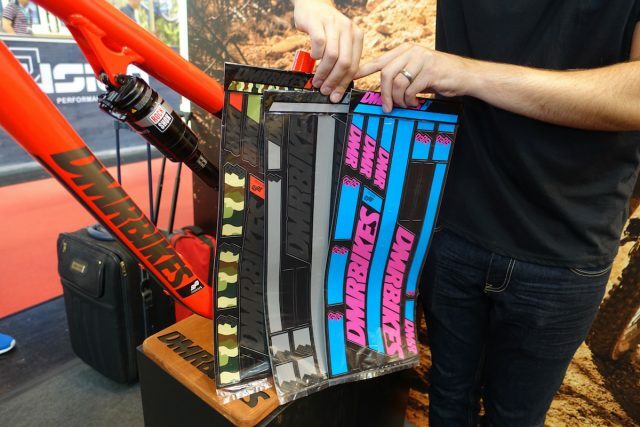 DMR is also offering custom sticker kits for those who want a little more pizazz for their SLED. 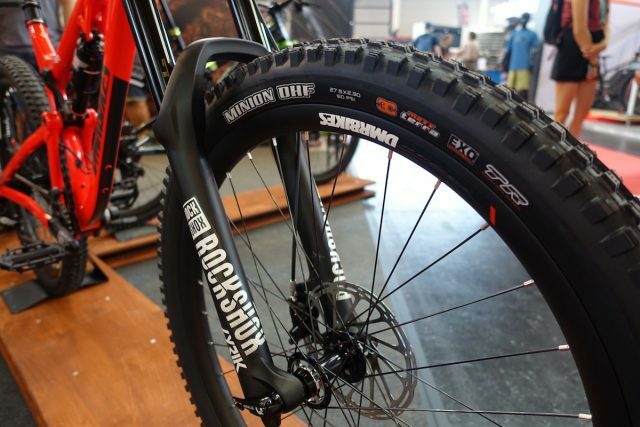 Maxxis Minion tyres replace the WTB tyres used on the previous spec. 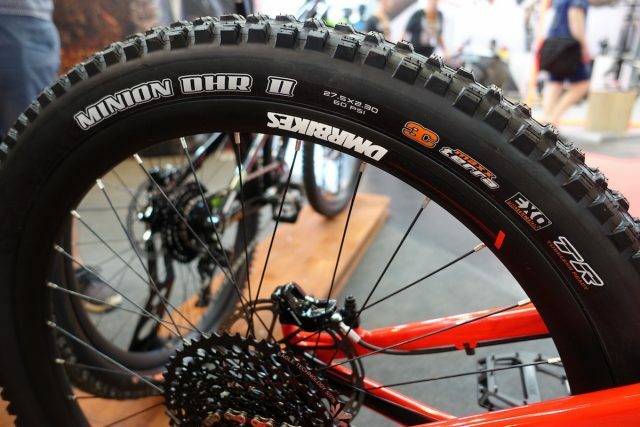 The excellent DHR II is used out back, thankfully replacing the lightweight WTB Trailboss tyre that we flatted multiple times. One more gear out back, with the 1×12 Eagle 10-50t cassette boosting the SLED’s climbing potential. 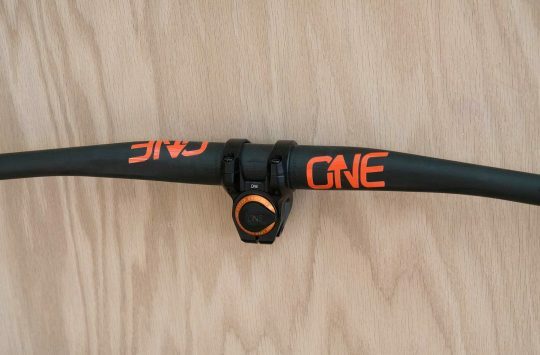 The X-Fusion Manic dropper post is now available in a 150mm travel option, which is a must for taking advantage of the SLED’s low standover height. Spot the offset bushing? 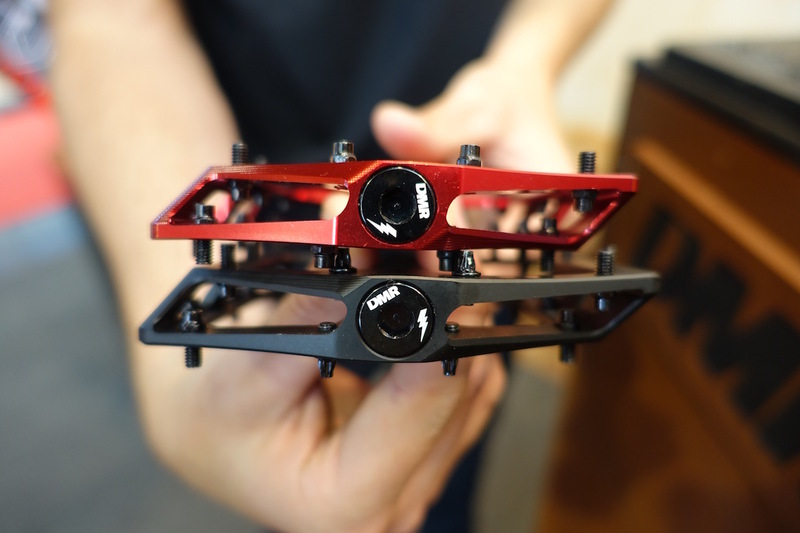 They’re used for both the top and bottom shock eyelets to help slacken out the angle and alter the rear suspension behaviour. So here’s the most subtle but arguably the biggest tweak to the 2018 SLED. While we got along well with the SLED for the most part during our testing, we did have some issues with the rear suspension firming up under harder and faster hits, which seemed to be caused by drivetrain feedback as the chainstay length ‘grows’ through the middle of the travel. 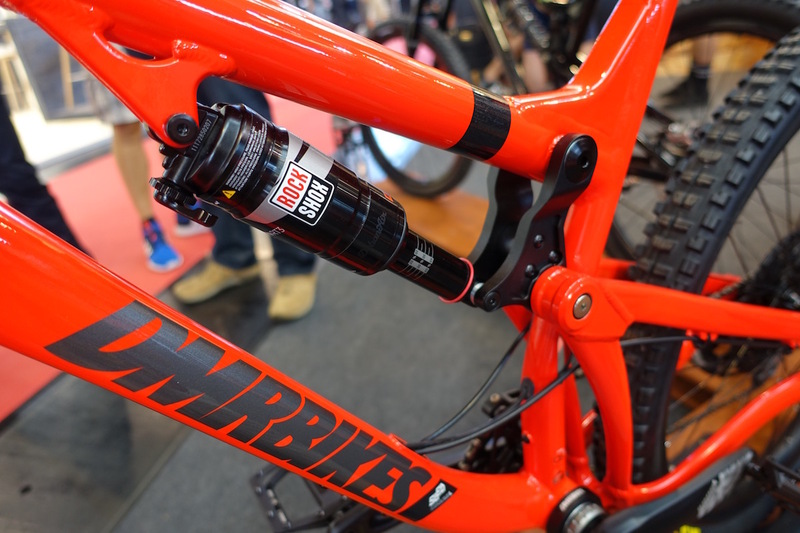 DMR has listened to that feedback amongst further comments from other reviewers, and has been trialling offset bushings in both the top and bottom eyelets of the rear shock in order to address the issue. 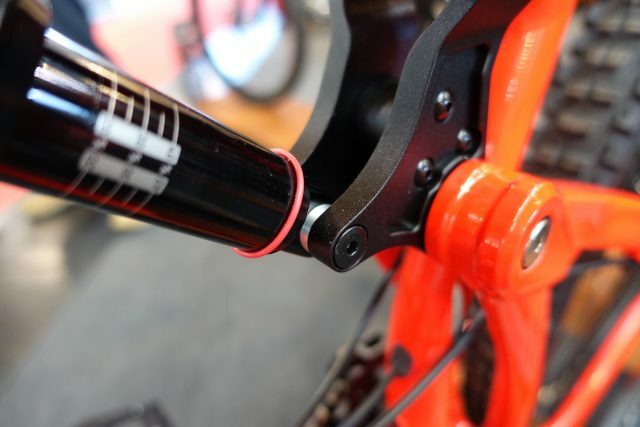 The offset bushes serve to push the rear shock further up the top tube, so that the upper linkage rotates forward ever so slightly – almost like it’s sitting into the travel further. 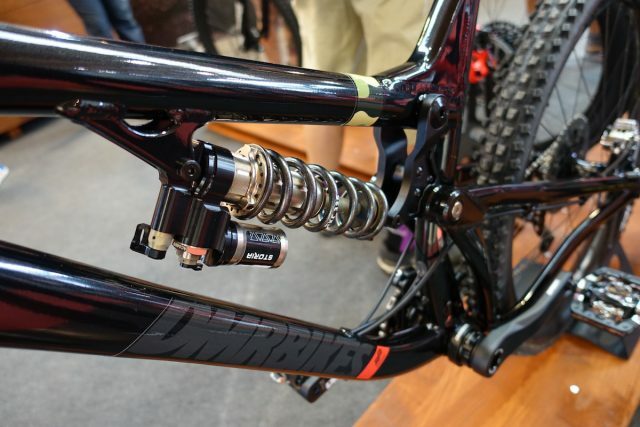 The overall travel remains the same at 160mm, but there is slightly less chain growth by altering the shock position. By pushing the shock forward with the offset bushes, DMR says the rear suspension kinematics have been altered to reduce chain growth. DMR states that the offset bushing not only enables a more ‘free’ feeling to the rear suspension travel by reducing the chain growth value, it also aids with slackening out the geometry too. 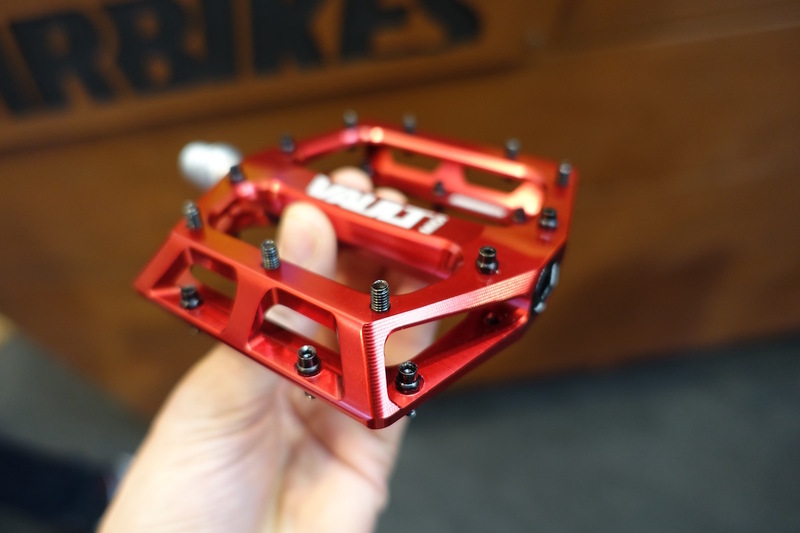 With offset bushes used in both the top and bottom shock eyelets, the DMR SLED now sits at 64.5° head angle when mated to the 170mm travel Lyrik. 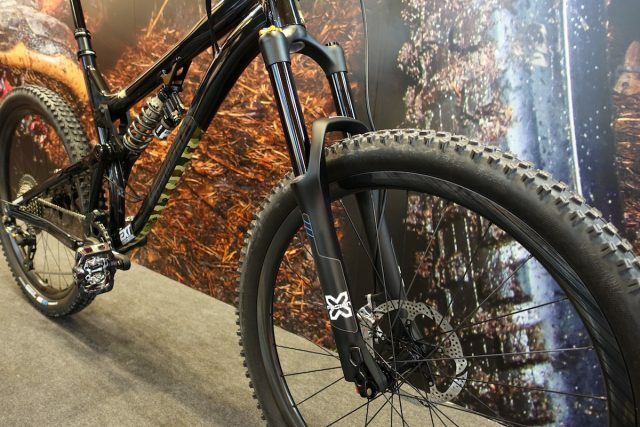 The SLED will still be available with a 160mm travel Pike, which at this stage won’t feature the offset bushes, as DMR believes the bike doesn’t need it. Also changed on the DMR SLED complete bike is the move to a lock-on grip, in the form of a brand new flange-less DeathGrip. 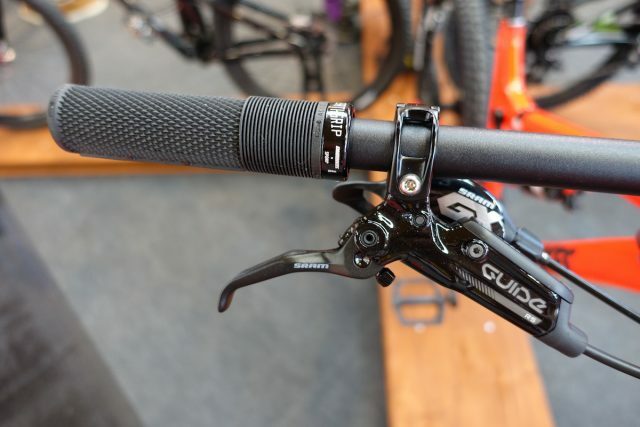 The flange-less DeathGrip is exactly what it says on the tin. The existing DeathGrips have been enormously popular for DMR, but riders have also been asking for a more streamlined version. So here it is! 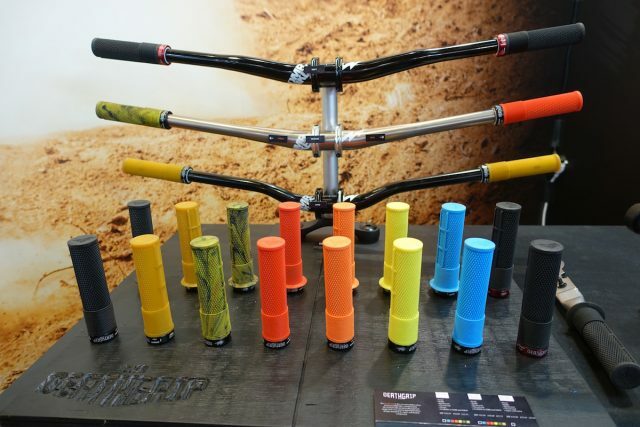 There are now flanged and flangeless versions of the DeathGrip, as well as Thick and Thin versions of each. 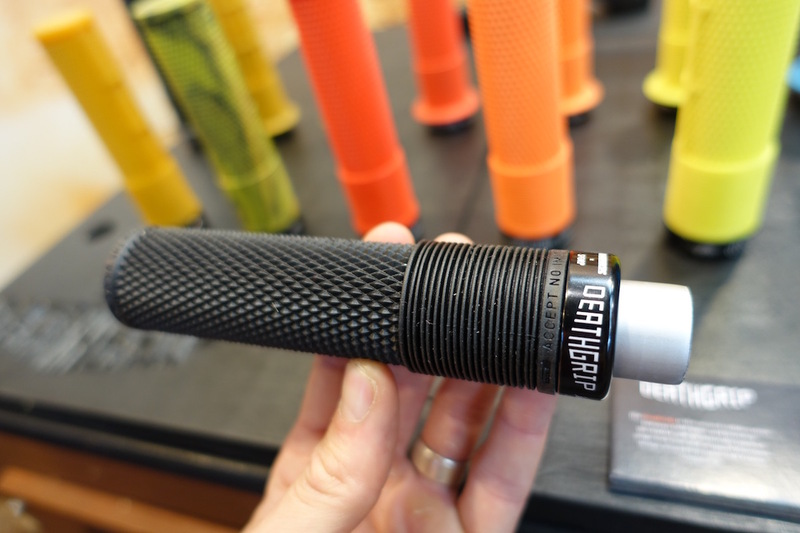 There’s also a new Soft compound (super-dooper soft), which is only available in black. Then you’ve got Medium and Hard compounds available too – so many choices! 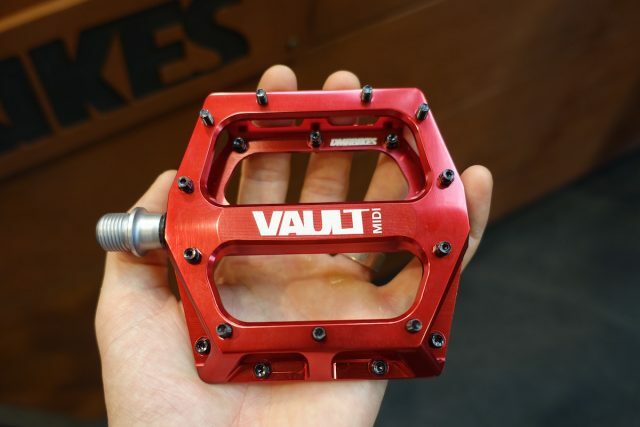 Likewise, the DMR Vault has been a wildly popular option amongst flat pedal users, but some had been calling for a smaller version. Shown here is the new Vault Midi pedal. 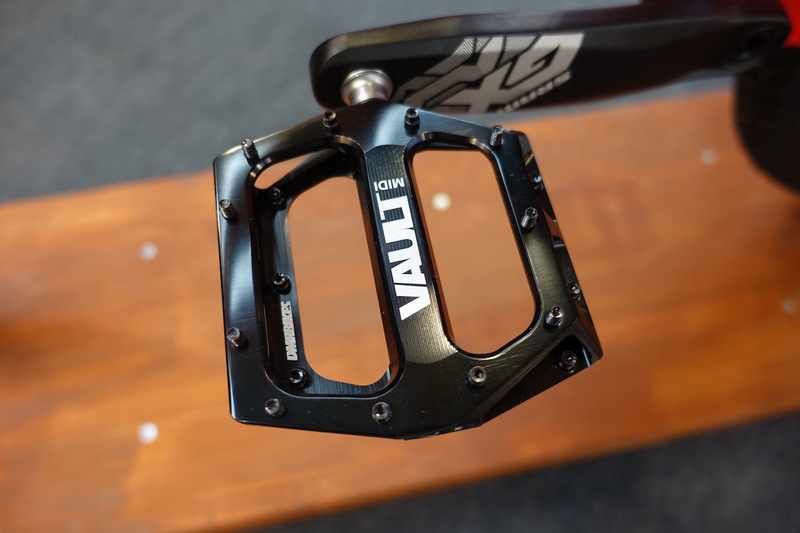 There are red or black versions of the Vault Midi, and it’s likely to be a popular option for XC and trail riders, or simply those with smaller shoe sizes. DMR also had this special custom-built SLED on display at Eurobike, which we just had to snap some photos of. It’s been decked out with a set of X-Fusion Sweep forks, which are now available in an all-black version for 2018. TRP G-Spec Quadiem brakes and flangless DeathGrips for this build. 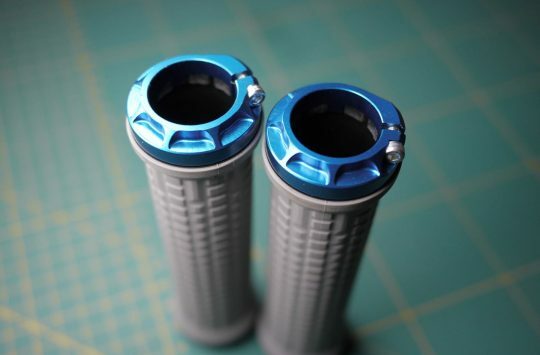 And the not-so-common Storia coil shock from Extreme Racing Shox. More info on this little guy soon.